A woman ahead of her time, Alida had a profound impact on the preservation of Savannah’s architectural traditions. She was a savvy and serious self made woman who lived in the house for 45 years. As an antique dealer, she lovingly filled the house with period pieces and collectibles that remain today. She also owned a restaurant in the basement of the Pink House, called “The Georgian Tea Room” during the depression. She lived through the turbulent milestones in American history, the great depression, both world wars and the Vietnam war. As a woman of invariable determination, Alida’s wisdom and traditional values were recipe to her success. The life of Alida Harper is a journey to be remembered. From a young age, she showed determination and expressed a joyful disposition. A pioneer in the restoration movement, Alida grew to become one of the most successful Savannah women in the 20th century. Her life and achievements are remembered still today as visitors explore the Harper Fowlkes House that is maintained just as Alida wanted. As a child, she spent many of her days in bed. At age 5, she contracted typhoid fever and had several surgeries due to a rare form of tuberculosis. This time spent lying in bed led to her fascination with drawing, watercolors and journaling. She kept diaries and scrapbooks with creative drawings and landscape watercolors that kept here imagination alive while bedridden. 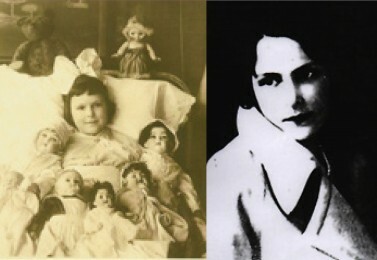 Her numerous dolls kept her company. Despite her physical condition, Alida remained active. After some primary schooling, she entered “finishing school” from 1924 to 1927 at New Sullins College in Virginia. Although, she was not an academic scholar, she maintained adequate grades and excelled in art classes. Alida’s teachers and friends often expressed that her artistic talents provided income to help pay her tuition. She would paint silhouette figures on brooches and on the backs of her classmates’ rain jackets. These “fundraiser” opportunities suggest that she possessed an entrepreneurial spirit even at such a young age. After graduating finishing school, Alida returned home and quickly became a Savannah socialite. She opened a small studio, “Variety Shop” in her parent’s home. In her journal she wrote, “Had two afternoon teas good write ups… You couldn’t say all Savannah turned out -but it wasn’t so worse.” Soon after her return home, her parents announced her official “coming out into society.” Her popularity flourished. 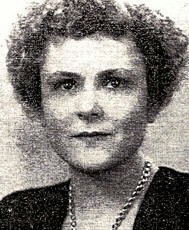 She and her “society friends” became active in bridge games, parties and debutante activities, and in 1928, she attends University of Georgia (UGA). During her time at UGA, she openend another variety shop, the “Loom and Art Shop” and thus her business career continued to flourish. On New Year’s Eve, 1939, Alida Harper and her mother moved into what is now the Harper Fowlkes house. Six years after she bought the house, Alida married Hunter McGregor Fowlkes, a tenant of the house. Unfortunately he died of natural causes a year and a half later. She did not inherit wealth from her family or her husband. She earned it, and lived frugally, by accumulating capital and investing wisely. Alida died in 1985 at the age of 77. In her will, Alida left the house to the Society of the Cincinnati in the State of Georgia to be used as state headquarters. She wanted future generations to see the lifestyle of the mid 1800s. Her will stipulated that the house is to be property maintained and can never be sold. All of the current furnishings were hers, including silver, china and crystal. Alida had an early appreciation for Savannah’s architectural heritage. Over the course of her adult life, Alida restored ten homes in Savannah and was involved in the early restoration movement in Savannah. During that time, she opened a weaving shop inside the Pink House. It proved to be unsuccessful, but her fate led her in the right direction.The Georgian Tea Room, another part of the Pink House, was closing, and Alida saved it. Although she knew very little about cooking, she was confident that this business needed saving. Her involvement with the Pink House and her ownership of the Georgian Tea Room paved the way to her critical involvement in the preservation movement. The group, Society for the Preservation of Savannah’s Landmarks, was organized to save the Pink House, and Alida attended the first meeting. Alida recalled, “This meeting was the birth of interest in old things and since then preservation and restoration have never been a dead issue” (Zimmerman). Anna C. Hunter, founder of Historic Savannah stated, Alida deserves a great deal of credit for making people aware years ago of the importance of keeping our outstanding historic buildings. She completed restoration projects without the advantage of a big bank account, going steadily from one building to another” (Zimmerman). Alida’s love for “old things” and preserving the past continues today as efforts are made to save Savannah’s historic houses. Her determination and bold character continue to be an inspiration for all. Alida had several other ventures. She bought a brick house on Hull Street and restored it. Her next purchase was a Greek revival building on Bull Street, also designed by Charles Clusky, the architect of the Harper Fowlkes House. The ground floor of the house was her antique shop, and currently the home of Shaver’s Bookstore. Alida eventually restored 10 houses. Two were restored and converted in luxurious apartments on Macon Street, they were both built in the 1840s. She also owned the Meldrim House and restored it. It was one of Savannah’s finer brick homes, and is also one of the most interesting historically. Alida renovated an 1819 vintage, located on 122 Oglethorpe Avenue. The house was made of English brick and had a charming ground floor with heavy overhead timbers. She put in an elevator and air conditioning. Alida shared many practical experiences with her friends. They believe that she had become a great leader in salvaging old landmarks. She was a big contributor in enhancing Savannah downtown area, rescuing houses and returning them to their former beauty, and encouraging others to follow her lead.